There are ongoing plans by some All Progressives Congress (APC) senators working in connivance with the presidency to forcibly reopen the Senate ahead of the September 25 date it was officially expected to resume. 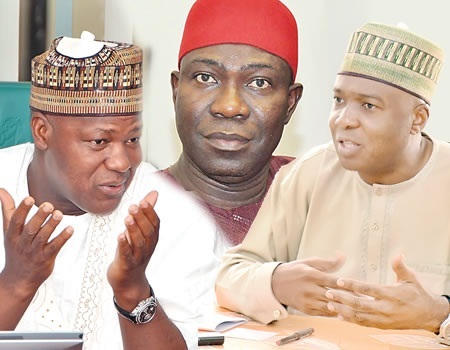 A presidency source told the newsmen that the move was being considered in view of the suspicion that Senate President Bukola Saraki may have taken the decision for a long adjournment for “selfish reasons”. A notable member of the Reformed APC, who confirmed the plot, said the presidency was being persuaded by some powerful individuals to forcibly reopen the Senate, impeach Saraki and his deputy, Ike Ekweremadu, and subsequently arrests them. Speaking with the reporters, Prof. Itse Sagay (SAN), Chairman of the Presidential Advisory Committee Against Corruption (PACAC), said the presidency lacked the power to reconvene the Senate ahead of the September 25 resumption date. In his remark, Yinka Odumakin, National Publicity Secretary of Afenifere, said it would amount to political gangsters and a return to military dictatorship if the executive arm of government decided on their own to reconvene the Senate. “They lack such power and it will be political gangsters carried to the extreme for the executive to now go and reconvene the Senate.